American Rebecca Porter was never one for fairy tales. Her twin sister, Lacey, has always been the romantic who fantasized about glamour and royalty, fame and fortune. Yet it's Bex who seeks adventure at Oxford and finds herself living down the hall from Prince Nicholas, Great Britain's future king. And when ex can't resist falling for Nick, the person behind the prince, it propels her into a world she did not expect to inhabit, under a spotlight she is not prepared to face. Dating Nick immerses Bex in ritzy society, dazzling ski trips, and dinners at Kensington Palace with him and his charming, troublesome brother, Freddie. But the relationship also comes with unimaginable baggage; hysterical tabloids, Nick's sparkling and far more suitable ex-girlfriends, and a royal family who private life is much thornier and more tragic than anyone on the outside knows. The pressures are almost too much to bear, as Bex struggles to reconcile the man she loves with the monarch he's fated to become. Now on the eve of the wedding of the century, Bex is faced with whether everything she's sacrificed for love - her career, her home, her family, maybe eve herself - will have been for nothing. I hate how much I loved this book. I knew exactly what it was going to be - it was going to be a "Kate meets Will", "humble girl meets dashing prince", kind of story. And I loved it. Especially on audiobook. Christine Lakin readthis 454 page book filled with a variety of accents. The 17 hour audiobook only took me 2.5 days. Grant it, I did speed it up a wee bit, but still, I powered through this hunk of a story. That last line sounds a little weird now that I've read it aloud, but I'm going to just go with it. This is where I would normally include a summary, but the Goodreads description sums it up pretty well. American girl goes to school in England. Girl meets heir to the throne. Girl and heir to the throne fall in love. Chaos ensues. There was nothing new about this story, and it was extremely predictable. But the characters were charming, and I came to care about them anyway. Especially the small group of friends that remain so close in Bex and Nick's lives since their days at Oxford. It made me think of the friendships in Bridget Jone's Diary and Four Weddings and a Funeral. I kind of love stories with a close knit group of British people :) Bex struggles with losing herself to the whirlwind that is royalty, and Nick worries about not having something he so desperately wants, a normal life. But what I believed, despite the flaws, was that these two people genuinely loved each other. And that was enough. Now you should read it so we can chat. Or you could always join us in Indianapolis this month for our Forever Young Adult book club! Thanks to the FYA ladies for picking out this title! I like to believe I would have gotten to it on my own, but my reading habits have been rather sporadic of late. 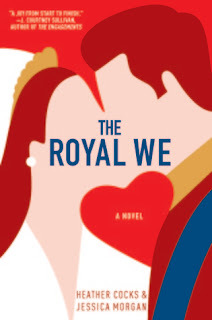 And if you're looking for a lovey dovey choice this February, I highly recommend The Royal We.